“We have always been the frontier,” a Shawnee leader remarked three centuries ago. This survey shows just how true that statement was. Writes Calloway (History/Dartmouth; The Scratch of a Pen: 1763 and the Transformation of North America, 2006, etc. ), the Shawnees proved to be the primary, and most substantial, obstacle to the settlement of Kentucky and the Ohio Valley, for which, following the Revolution, the American nation hungered. For a quarter-century after independence, the Americans faced an enemy with many advantages, logistical and strategic. “Never again would Indians face Americans on such nearly equal terms as they did here,” Calloway observes. “Never again would Indians win victories of the magnitude they did here.” The Shawnee people organized themselves politically to respond to tasks, with two of the five divisions devoting themselves to politics, the others to medicine, religion and warfare; this fluent, semi-autonomous governance made for swift action, coupled with the Shawnees’ talent for forming alliances with other Indian peoples. So it was that in the early 1800s, Tecumseh and his brother Tenskwatawa forged a confederacy of very different partners, making a highly effective army from nearly 30 tribes pledged to fighting white expansion and resisting white ways. This armed struggle, Calloway notes, began under British rule, when the Shawnees were played against the French and their Indian allies in the Seven Years War; for the most part it ended with the British defeat in the War of 1812. In between came savage battles against Blue Jacket, Tenskwatawa, Tecumseh and other Shawnee leaders, most of which ended with grudging respect for the Indian enemy—especially Tecumseh, whose “character, charisma and courage made him a heroic figure in Canada and Europe as well as the United States.” Heroic leadership or no, the Shawnees were eventually broken, removed to reservations in Oklahoma and Kansas as their woodland dominion fell to ax and plow. 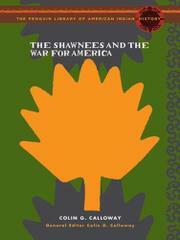 An illuminating overview of Shawnee-white relations.